Was instrumental in securing Medals of Honor for JA WWII vets. HONOLULU — Daniel Kahikina Akaka, the first Native Hawaiian to serve in the U.S. Senate, died Friday due to organ failure, Hawaii News Now reports. He was 93. According to his daughter Millannie Akaka Mattson, he had been hospitalized since November and died around 5 a.m. at St. Francis, where he had been in hospice. “We are so fortunate to have him as long as we did. We were very lucky,” his family said in a statement. During his tenure in the Senate from 1990 to 2013, Akaka was instrumental in the passage of a 1993 resolution that acknowledged the U.S. government’s overthrow of the Kingdom of Hawaii 100 years earlier. Akaka sponsored legislation requiring the Department of Defense to review the records of over 100 Japanese American and other Asian American servicemen during World War II to determine if any of them had been unfairly denied the Medal of Honor. He noted that despite the enormous casualties suffered by the 100th Infantry Battalion/442nd Regimental Combat Team, only one member — Sadao Munemori, who was killed in action — received the medal. Akaka also introduced legislation to help Filipino veterans who fought for the U.S. during World War II, as well as Afghanistan and Iraq veterans suffering from PTSD. Born in Honolulu in 1924, the youngest of eight children of a Native Hawaiian mother and a Hawaiian-Chinese father, Akaka graduated from the Kamehameha School for Boy sin 1942. During World War II, he served with the Army Corps of Engineers on Saipan and Tinian. Entering college under the G.I. Bill, he earned a bachelor’s degree in education from the University of Hawaii in 1952 and worked as a high school teacher and administrator in Honolulu. In 1969, Akaka was hired by the Department of Health, Education and Welfare as a chief program planner. He then served as director of the Hawaii Office of Economic Opportunity, human resources assistant for Gov. George Ariyoshi, and director of the Progressive Neighborhoods Program. Akaka, a Democrat, was first elected to the U.S. House of Representatives in 1976 to represent the 2nd Congressional District, which covers all of the state except Honolulu. He was re-elected seven times. In 1990, Gov. 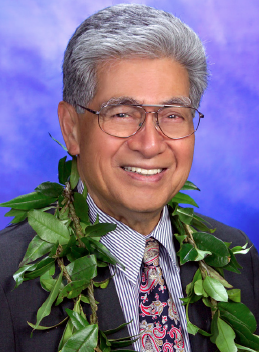 John Waihee appointed Akaka to the Senate after the death of Sen. Spark Matsunaga. That same year, Akaka was elected to serve the remaining four years of Matsunaga’s term, defeating Rep. Patricia Saiki (R). He was re-elected for full six-year terms in 1994, 2000 and 2006. In the latter election, he overcame a Democratic primary challenge from Rep. Ed Case. Akaka chaired the Senate Committee on Indian Affairs and the Congressional Task Force on Native Hawaiian Issues, and served on the committees on Armed Sevices; Banking, Housing and Urban Affairs; Homeland Security and Governmental Affairs; and Veterans’ Affairs. In 2011, Akaka announced that he would not be running in 2012. “I have always strived to serve the people with much love and aloha, never forgetting my humble beginnings, and it is my hope that they, too, will continue this tradition,” he said at the time. Akaka was eulogized by Hawaii’s state leaders and congressional delegation. Gov. David Ige: “Our beloved Sen. Akaka lived a life of service and aloha, and each of us in Hawaii has benefited in countless ways. Our state mourns the loss of this man of upright character. Sen. Mazie Hirono: “Senator Daniel Kahikina Akaka embodied the Aloha Spirit. He dedicated his life to serving the people of Hawaii as an educator, and in the U.S. Army, state government, the U.S. House, and the U.S. Senate. In Congress, Senator Akaka’s care, empathy, and collegiality served as an example for us all. “It’s an honor to sit at his desk in the Senate chamber, and we continue his work to improve the lives of veterans and the Native Hawaiian community. Rep. Colleen Hanabusa: “Hawaii’s heart is broken this morning as we learn of the passing of one of our greatest statesmen. He represented everything that was good in all of us. He represented that which is Hawaii. Thank you, Senator Daniel Kahikina Akaka, for your legacy of courage and love. You taught Congress and our nation how to fight with dignity and aloha. We all aspire to lead like you. Rep. Tulsi Gabbard: “Today is a sad day for Hawaii and our nation. Senator Akaka truly embodied the aloha spirit and selflessly dedicated his life to serving others. He treated everyone equally, with kindness, respect and love — no matter who they were or how they treated him. He responded always with aloha, sharing his warm smile and embrace with all. In addition to his wife, Mary Mildred “Millie” Chong — with whom he would have celebrated their 70th wedding anniversary on May 22 — survivors include four sons and a daughter, 15 grandchildren and 16 great-grandchildren. Ige has ordered that the U.S. and state flags be flown at half-staff throughout Hawaii. Services are pending.